Every Saturday morning during farmers market season, an art market takes place on Lake Anne Plaza. If you haven’t taken a close look at the vendors there, I encourage you to do so. There is a lot of talent and quality on display every week. 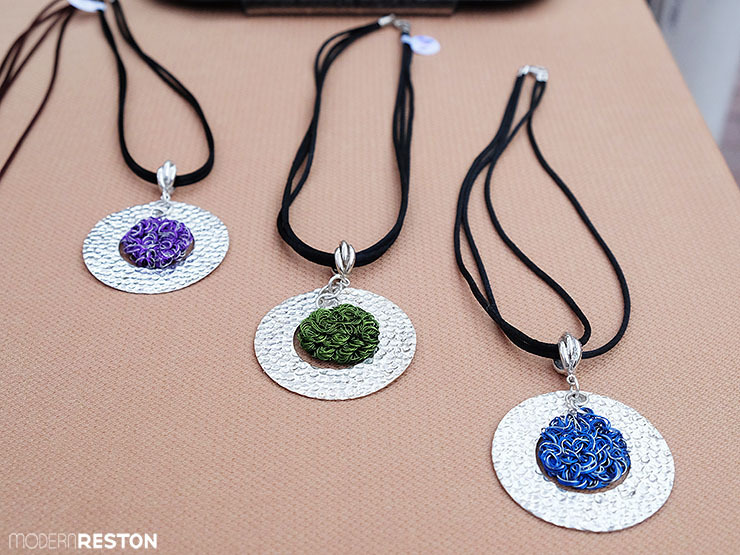 I’ve discovered some beautiful artwork and hand-crafted products at the Reston Market over the years, and my most recent fun find is the jewelry of Alessandra Eusebi. At first glance, Alessandra’s jewelry appears beautifully sleek and understated, with clean lines and modern style. When you look closer, you notice how deceptively intricate these pieces are, with delicate beading, interlocking silvers, and knitted wires. Alessandra Eusebi is a jewelry artist who lives and works in Peru. Her brother, Maurizio, lives in Northern Virginia and operate the U.S. side of the business. 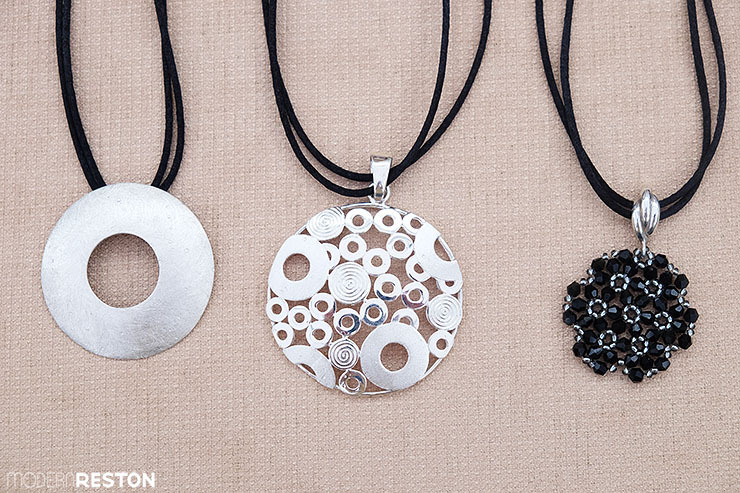 He displays the jewelry on most Saturdays at the Reston Market, as well as at other art fairs in the D.C. area. Alessandra designs and creates much of the jewelry, and she has taught Maurizio to create some of the pieces here in the U.S. She also hires Peruvian artisans to construct some of her designs. Maurizio proudly explained to me that it’s important to his sister to employ people in her community and pay them fair wages. Modern Reston: How did Alessandra Eusebi Jewelry begin? Alessandra Eusebi: I started designing my own jewelry back in 2002, making pieces that I would like to wear. My friends and people started commenting and asking where I bought them, so I started doing a few pieces for them. Before I knew it, people started asking for more pieces, re-ordering and referring me to their friends. After having a very good success with friends and friends of friends, I got the idea to make a business out of it and decided to create my company in Peru. In 2009, my bother moved to the US for work, and in 2012, he convinced me to start offering my designs there. I taught him how to make some of pieces, and now he is making them in the US. Sometimes I send him my drawings or ideas and in other occasions he designs his own. MR: What is your background with jewelry design? AE: I studied at the University of Lima and have a bachelor’s degree in Business Administration. I do not have any formal jewelry design training, however I always liked designing not only jewelry, but also interior design, furniture, and more. I self-taught myself all that I know. After having my first child, I stopped working to become a full time stay-at home-mom. When my kids started going to school, I began designing jewelry in my spare time. Once my friends started asking for my designs and I got more and more orders, I decided to design jewelry as my full time job. MR: What is your approach to jewelry design? What is the inspiration behind them? AE: I am always looking to do different things to give my designs a modern look, using materials that I have on-hand. For example, once I was visiting with a friend that designs and makes shoes, and noticed she had scraps of colored leather lying around, and decided to incorporate them into some of my pieces. In some cases, I check out the current trends and adapt my own style, always looking to keep the uniqueness in my jewelry. I always try to keep a pad and pen on hand to jot down my ideas — you never know what can inspire you. MR: One of the things that really appeals to me is the jewel-tone color palette. How did you choose that color scheme? How did you get the idea to work with copper wire? AE: While walking around a flea market the copper wire and the color scheme caught my eye, and I decided to incorporated in my designs. At the beginning I did not know how I was going to use it. Then I got an idea from a friend to knit with it, but I modified the original technique to adapt it to my style. I started with some of the brighter colors in the spring and summer, and people liked them so much that I looked for other colors that could go well with fall and winter outfits. Using color had added a lot to my jewelry, making it more fun or adding a splash of color to add that extra “pop”. MR: Is there anything else you want our readers to know? AE: I only make a few pieces of each design to make them more unique. I am constantly coming with new designs, combining different materials with sterling silver, such as leather, natural stones, crystals, or pearls. They make a perfect gift because you know its something that you won’t find anywhere else. Each piece is carefully hand-crafted, so I feel like I am giving people something special and unique. MR: Where else can people find your jewelry? AE: We sell online on our website, and we are constantly going to different fairs, bazaars or shows around the Washington Metro Area. People can find information about upcoming shows on our Facebook page. 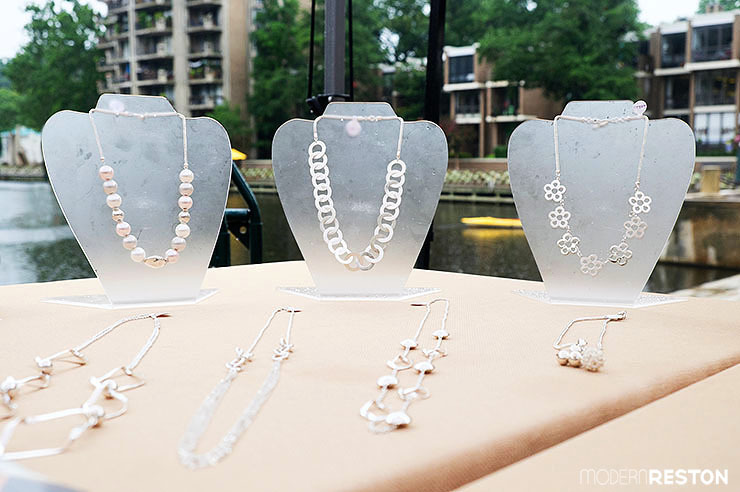 Alessandra Eusebi Jewelry is available most weeks at the Reston Market, which is located at Lake Anne Plaza on Saturdays from 9am-1pm during the farmers market season. 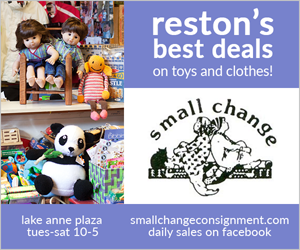 The Reston Market also features the work of many other local jewelry designers, painters, photographers, woodworkers, and more. Do you have a favorite local artist or artisan? Please get in touch with us and help us discover the talent in this area.